The scientific findings emerging from epigenetics have significant implications for public policy (e.g., this conference paper on epigenetics and obesity policy or this post about epigenetics and the Environmental Protection Agency), but the philosophical challenges presented by epigenetics are even more profound than just these practical policy implications. In particular, epigenetics challenges the very foundations upon which our contemporary ethics and politics are based. As the science from epigenetics is just now emerging as a challenge to many aspects of conventional genetics, the social and political effects of epigenetics are just now emerging as well. 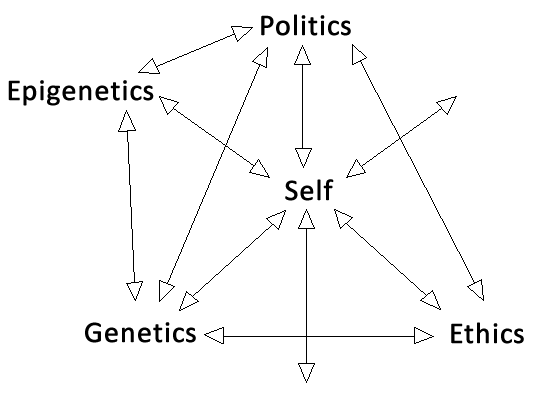 My project is to anticipate the nature of the ethical and political effects of epigenetics via the model presented below. This model revolves around the often overlooked linkages between our politics our ethics and our biology, to be understood as our understanding of the physical composition of humans and of our physical relationships with each other and with our environments. How we understand our biological development and origins is inextricably linked to how we perceive ourselves—and more literally our selves—as a metaphysical concept. These biological and metaphysical conceptions of how we understand ourselves together constitute the foundations of our ethics, or our concepts of what is right and wrong, which are then ideally translated into our politics. The political and intellectual history of the West is marked by many such instances when the prevailing politics and ethics have been influenced by changes in the understanding of our biology, just as our understanding of our biology has been influenced by changes in politics and ethics (as discussed here and here). The introduction of contemporary epigenetics is just the latest iteration of the model in Figure 1, with a couple of additions. In particular I situate the impact of epigenetics for politics via the challenges epigenetics presents to the conventional understanding of genetics. Therefore, to incorporate epigenetics into the model of Figure 1, I substitute “Genetics” for “Biology” in the lower left vertex of the model, of Figure 1 as displayed in Figure 2. This invocation of genetics is necessary for the entrée of epigenetics into the flow that eventually explains political change, as the science of epigenetics is best understood in the context of its challenges to the science of genetics. As discussed in a previous post, there is a common intellectual lineage between the scientific assumptions of genetics which conceptualize our genes as our biological essence and the philosophical assumptions which frame our prevailing concept of the individual self as our philosophical essence. The concept of self which results from this shared scientific and philosophical history constitutes the basis our conventional ethics, which ethics ideally become embodied through our politics. 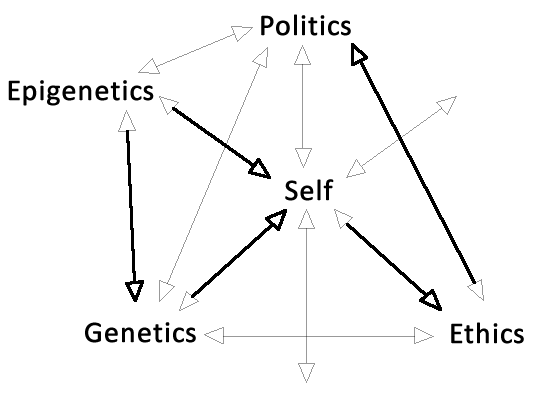 This specific causal path from genetics to politics is highlighted in bold in Figure 3.
in which epigenetics is triangulated between genetics and politics and the concept of self, both influencing and being influenced by genetics and by politics (as discussed here and here) and the evolving conceptions of the self. However, to simplify even further, the specific pathway of causation that is the primary focus of this project is diagrammed as the highlighted bold lines and uni-directional causal arrows in Figure 5. Before delving into the particulars, though, the necessary connections between biology, ethics and politics must be established. Without this interconnectedness of biology and ethics and politics, the introduction of epigenetics becomes little more than a practical policy concern; because of this interconnectedness, though, epigenetics as a new source of knowledge about human biology has significant political and ethical implications well beyond these more mundane policy concerns. Ultimately, the critical factor linking politics and ethics and biology is political legitimacy. Political legitimacy is defined as the generalized perception that the actions of a government are “desirable, proper, appropriate within some socially constructed system of norms, values, beliefs, and definitions”, or more colloquially that a government’s policies are perceived as “the right thing to do”. As Judith Shklar observes, history shows that every form of government maintains its legitimacy primarily “by reinforcing the ideological values upon which it is based,” and that because “it is neither psychologically feasible nor politically possible to evade them…no one can hope to govern without reference to these values”. In other words, the legitimacy of a politics depends upon the degree they reflect a specific ethical standard. 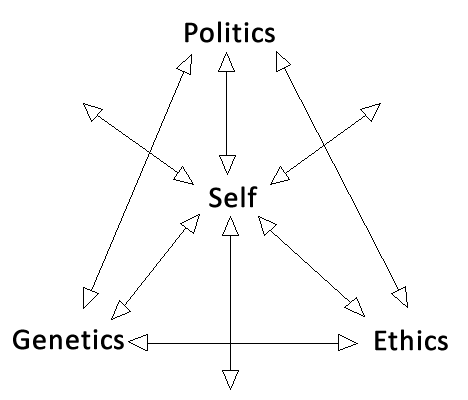 Therefore, as illustrated by Figure 5, to the degree that epigenetics influences the prevailing ethics is also the degree to which the politics will also have to change in order to maintain congruence with these ethics. The more congruency between a politics and a prevailing ethics and a biology, the more those politics are going to be perceived as legitimate. To the extent that the politics do not match an ethics or that this ethics is contradicted by the biology is also the extent to which those politics are considered illegitimate. This enhancing or undermining role of biology in regards to ethics and politics is one of the functions of epigenetics as illustrated in Figure 5. Importantly, biological facts like those from epigenetics do not of themselves provide ethical imperatives (i.e., there is no fallacious appeal to nature here); rather, the biology provides an epistemic context for the application of the ethic, which is then translated into political focus. 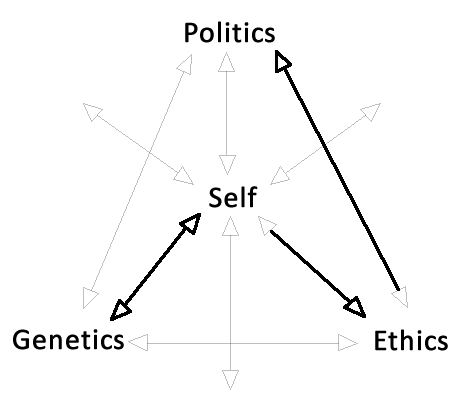 This epistemic influence on the composition of ethics is another function of epigenetics as illustrated in Figure 5. Epistemic knowledge that smoking causes cancer, in itself, does not have any clear policy implications. It has to be combined with phronetic arguments as to why the causes of cancer should be addressed, and practical-technical arguments about whether desired reductions in smoking are practically feasible. Phronetic claims that harm should be avoided are substantially strengthened if there is epistemic evidence that pinpoints the causes of harm, and that such causes can manipulated by policymakers. None of these types of arguments, by themselves, would amount to a comprehensive case for restricting smoking in public places, or for raising taxes on tobacco. It is the combination of all three that builds a coherent policy argument. As demonstrated by this real world example, Meehan’s “significant human purpose(s)” in regards to smoking and cancer are not supplied by either the science or the politics but are provided by ethical claims about what constitutes the good life. These ethical claims combined with the science then determine the appropriate focus of policy. Policy provides the means for realizing these ethical ends via the recommendations of science. 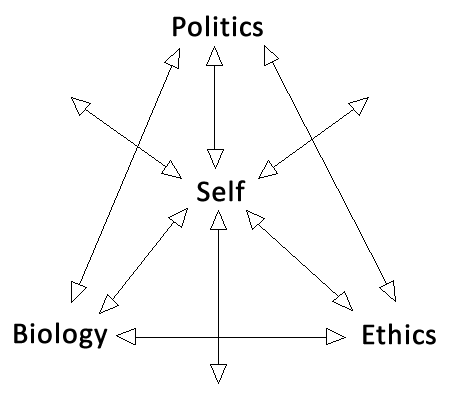 This is the interconnection between science, ethics and politics indicated by the bi-directional causal arrows of Figure 4. But Meehan goes even further in linking science, morality and politics. in noting that science is actually one of the prerequisites for morality because “where there is no knowledge there can be no choice,” and that “science (which is essentially capacity to act) actually requires mankind to be moral by forcing choice”, or that without the knowledge provided by sciences like biology there is no opportunity for action. In this sense, the introduction of the novel scientific knowledge from epigenetics provides not only fresh grist for the mill of ethics, but also thereby provides new opportunities for action as well as the standard by which such political actions can be adjudicated as moral (i.e., legitimate) or not. This is the true potential political impact of epigenetics, the elaboration of which is my main project. Hardy, J. (2014). Legitimacy in the use of force: Opinio or Juris? Refereed paper presented to the Sixth Oceanic Conference on International Studies University of Melbourne 9-11 July 2014; Dingwerth, K., Lehmann, I., Reichel, E., & Weise, T. (2014). Democracy is Democracy is Democracy? Changes in Eval-uations of International Institutions in Academic Text. This is a preprint of an Article accepted for publication in International Studies Perspectives. Shklar, J. (1979). Let Us Not Be Hypocritical. Daedalus , 108 (3), 1-25. Meehan, Economics and Policymaking: The Tragic Illusion, 1982, p. 11. Tenbensel, T. (2006). Policy knowledge for policy work. In: Colebatch, H.K. (Ed. ), The Work of Policy: An International Survey. Latham, MD: Lexington Books, pp. 199–216. Meehan, E. (1982). Economics and Policymaking: The Tragic Illusion. Greenwood Press, 42.